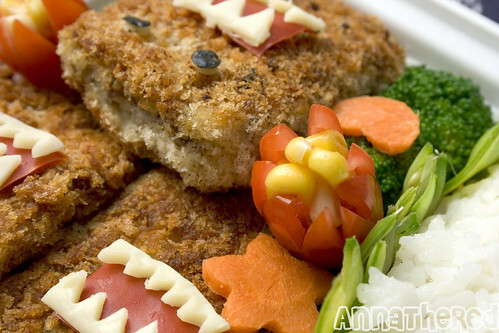 Posted by AnnaTheRed in bento blog (all), bento blog - anime. The croquettes didn’t look very good in the photos, so I decided to re-shoot some stuff again. I’ll post a how-to sometimes this week. But since I had already made them, I decided to use them for a quick regular-ish bento. First I put rice on the bento box. YES, this is how much rice my boyfriend usually eats. His regular bento, like this one, might have a little more rice than a kyaraben (because a kyaraben has more non-rice food than a regular bento), but not by much. It may not look like the kyaraben I make has that much rice, but because the rice is usually molded in my kyaraben, it look like there’s a lot less rice than my regular bento. We both LOOOVE rice and eat a lot of it. After I put rice, I put sauteed renkon (lotus root) on the side next to rice. 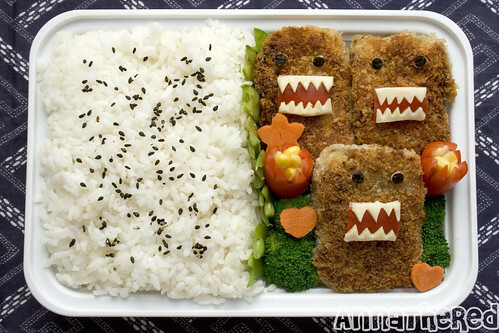 I asked how many Domo-kun he wanted, and he said three, so I put three Domo-kuns next to the rice. Looking a bit too crowded. Kind of like a Japanese train at rush hour. 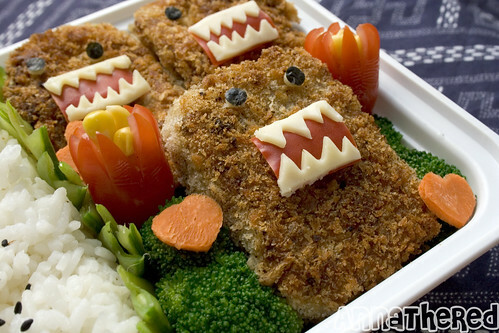 Of course, there weren’t enough veggies, so I boiled broccoli, sprinkled salt on it and stuffed it around a Domo-kun. To brighten up the bento I added two cherry tomatoes with corns. Rice kept falling onto Domo-kun, so I cut snowpeas with a diamond shaped cutter, and stuck them between the rice and Domo-kuns. I threw some frozen cut out carrot from the freezer (see “how to freeze carrot flowers”) to add more color. But the rice was still more than half of the bento box… So I sprinkled black sesame seeds on top. It may look weird, but black sesame seed and a little bit of salt on rice is very common seasoning (?) for rice in Japan. 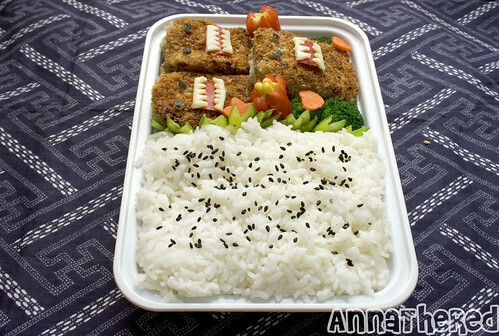 This is an amazingly half-assed bento. It probably took 30 minutes or so. Not sure this is considered a kyaraben, but since Domo-kun is a character, I thought “Oh, why not?” If I had more time, I definitely would’ve done something to the rice though. 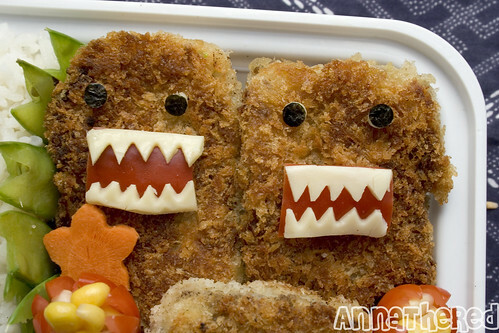 Not as exciting as my usual kyaraben, but just three Domo-kuns were cute enough to brighten up the bento.